Bring luck to your life with a lucky cat figurine. Most likely, you’ve seen Maneki Neko statuettes in restaurants, shops, beauty parlors, bars, and other business establishments. Many people also have one at their home and office. Who can miss that kitty with his right (and sometimes left) paw raised in a welcoming gesture? 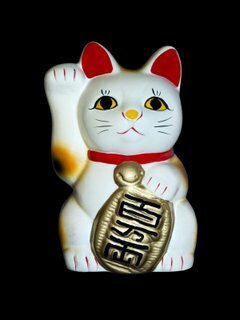 A lucky cat statuette is used to attract customers, more business and, of course, more money. Some even claim that a Japanese cat figurine will also attract love and success of every kind. Usually, it is displayed in windows and on countertops. Also known as Beckoning Cat, Fortune Cat, and Money Cat, Maneki Neko has become quite popular in the United States and other parts of the world. So where did it originate? Even though there is no conclusive evidence of how exactly this tradition started, experts believe that Maneki Neko (which literally means Beckoning Cat) originated in Japan. The first Maneki Nekos appeared during the Edo period (between 1603 and 1868). There are, however, legends that claim that the Beckoning Cat is much older than that. In any event, the image of Maneki Neko now appears in a wide array of merchandise, including key chains, sake sets, t-shirts, posters, tote bags, piggy banks and much more. Undoubtedly, images of lucky cats make great cat lover gifts, so here are a few items to consider. To learn more about Maneki Neko, go to this page. And for additional information about Japanese cats and more gift ideas, please visit the links below.